I'm not much of a golfer, but I do enjoy 18 holes every now and then. However, when I golf at a new course, I usually rate that course not so much on the technical aspects of golf course design, but more on how entertaining I find the terrain. I appreciate grand vistas from the tee box, or impressive trees in the middle of the fairway. It doesn't matter to me who designed the course, whether it's Nicklaus, Palmer, Miller, or any of the host of golf course designers out there. What I care most about most, is that the designers make the course visually appealing. Give me something to look at while I wait for my brother to complete his 15 practice swings. About two minutes from my house there is a country club. The parking lot is full of expensive cars, and you can order lobster from the menu. But when it comes to the golf course, it's about as bland as a rice cake. Luckily, a 30 minute drive will take you to a different kind of course. At this golf course the only food you can purchase is of the fried variety. The parking lot is full of old jalopies, and on a hot summer day you might see a golfer with his shirt off. Even with the shirtless course patron, the loss of decorum is more than made up for by the entertaining design and terrain of the course. For me it's not what's on the menu back at the club house, but what's out there on the course. Recently, I was able to play at just such a course. This was at the Four Seasons golf course at the Peninsula Papagayo, in Costa Rica. I was there during the dry months and even though the scenery was not as green as I had imagined, the views from some of the tee's were fantastic. Even with the brutish heat and the five dollar candy bar, this place was as fun as they come. Right off you know you're playing somewhere special, but it isn't till the third hole that you really grasp the beauty of the place. From the third hole you get a great view of the pacific ocean with rocks jutting from the sea and the surf breaking in white splendor as far as the eye can see. However, it was at the sixth hole, where I found a hole that embodied everything I love about golf . It has a tremendous view of the water and the coast, but what makes it so spectacular is the nearly 300 feet of sloping decent down to the flag of this par 4. I spent some time craning my neck and straining my eyes, looking down this U-shaped valley, trying to catch a glimpse of the flag far below. I could have hit balls all day off of the box, but instead I hit only two after my first ball sailed into the trees on the left. A couple of holes later we found ourselves at another big downhill tee off. Only this time we had some company. A group of howler monkeys relaxed in the trees above us, making distracting noises. It was as if they were mocking warm up swing I took. In the end it didn't matter, and I was able to put one down on the fairway. The thing about Papgayo is, it's not just exciting to play the course, it's also a thrill ride on the golf carts. Some of the descents golfers have to negotiate in their carts are best described as precarious. Not only are they steep, but for some reason they have installed speed bumps. As if anyone would voluntarily try to break the land speed record, in a golf cart, on one of those hills. There must have been two or three descents where my passenger gripped the side bar with white knuckles. I even think I heard him mutter a prayer. As I finished the course I reflected on how awesome the experience had been. 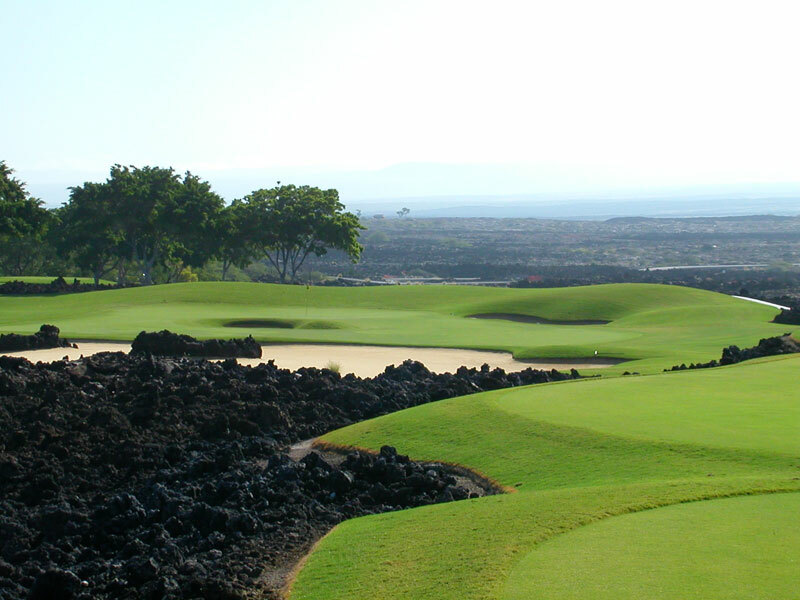 All the elements that make up a good day of golf were there, Monkeys, large lizards, extreme golf cart driving, long drives off of hilltop tee's and most of all stunning views of the pacific ocean and it's rugged coast were present at Papagayo. And as I sipped my nine dollar Gatorade I thought about the golf course back home with the fried foods and shirtless players. I released that even though I'm far from a good golfer. There still is an element of the sport that I can enjoy.